Dirk Ahlborn is two hours behind schedule, and it's no surprise, since the project that he represents has the potential to change the world. He's the CEO of Hyperloop Transportation Technologies, one of the firms that's dedicated to building those high-speed tubes people of the future are always traveling in. It's got so much potential that you can even see hope in the eyes of the people standing in his presence, waiting for their turn to speak to the German. You might have heard that Elon Musk dreamed up this idea, but it's Ahlborn who's most likely to make it a reality. 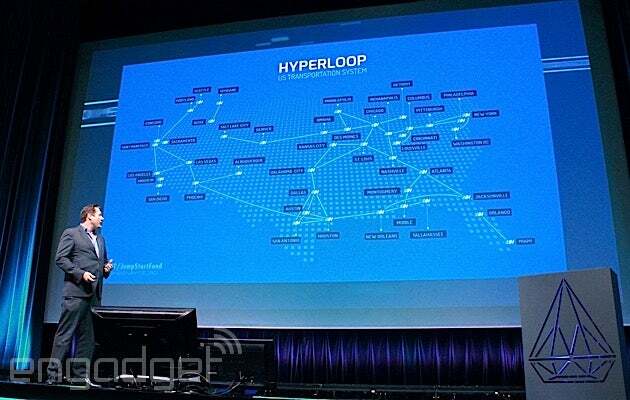 Say hello to Mr. Hyperloop. It's not a name that Ahlborn likes hearing, going to great pains to emphasize the community that has developed around the project. That includes almost 400 scientists, engineers and experts that are working, ostensibly for free, to help develop the Hyperloop system -- not to mention partner companies and universities. Then there's the wider community whose input, feedback and general engagement are helping to shape the future of mass transit. The CEO is clearly feeling frustrated at the misconceptions that seem to surround the project, and they weigh heavily upon his impressively broad shoulders. For instance, he resents the idea that his company is staffed by amateurs, keyboard warriors and other concerned, but otherwise uninformed people. In fact, many of them have day jobs at Tesla, NASA, SpaceX and other brand-name, heavy science firms. Ahlborn bristles at the idea that these people, who donate their time in exchange for stock options, do so only for a bounty further down the road. Instead, Ahlborn points to other open-source projects like Firefox and Android as examples where like-minded individuals come together to build something that they believe in. He also cites companies like Lego and GE that he feels were heading for obscurity until they, too, started to cooperate with the wider community. Another misconception that Ahlborn has to fight is the idea that users would be crammed into the pods at awkward angles. It was propagated by the early concept document (pictured, above), but the CEO says that the company has moved far away from that now. The current thinking is that a 9-foot-wide economy class pod would hold 40 people, sitting upright in relative comfort, while a business class pod would seat 28. To the relief of nervous travelers everywhere, there will be a bathroom in the finished model, although it's there more to calm anxious minds than it is for constant use. CNBC had previously reported that the Hyperloop could be "free to play," a point Ahlborn said was taken out of context. In fact, the most likely business scenario now is that users would pay $30 for an economy class "ticket" for a single ride between San Francisco and LA. Even if you took the bus, the seven-hour journey would cost almost twice as much. 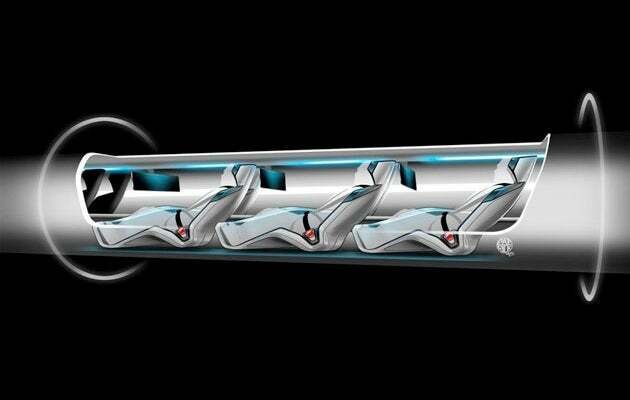 With the Hyperloop, a return trip is likely to cost $50, with business class seats costing more. Still, since the LA-SF route will only be half an hour long, we could probably put up with a fair chunk of discomfort. Ahlborn tells me that, in the US, it's rare that a public transportation project turns a profit -- they frequently need a subsidy from the government. For the public company that HTT will become, it's a requirement, so there's a determination to ensure that the business is run properly. Since he will have a captive audience for the better part of 40 minutes, it's likely that there will be at least one screen displaying adverts inside each pod. The tubes themselves will also have space for billboards, which will help reduce the cost for each individual traveler. Another idea that's being kicked around is that pricing would vary depending on time to keep the system 100 percent occupied through the day. So, at peak times, a form of surge pricing would be in effect, with off-peak hours being far cheaper to balance it out. For one brief moment, Ahlborn speaks with reverence about Ryanair, the much-maligned Irish airline. It's famous (at least in Europe) for offering dirt-cheap fares, but subjecting its customers to a death from a thousand nickel-and-dime cuts, including charging them hefty fees to print their tickets. The CEO has no intention of replacing the airline's Michael O'Leary as the most hated man in transport, but admires the company's ability to make travel affordable to the masses. What is being fired at 750 miles per hour through a windowless tube going to be like for those of us who feel travel sickness at the start of an engine? Hyperloop Transportation Technologies is working with a team of psychologists who are specifically researching how to eliminate any such side effects. The current thinking is that there'll be a forward-facing screen that projects a virtual image that'll convince your brain that the motion your body is feeling is genuine. Then again, Ahlborn points out that there's no such view on an airplane, so maybe there is no need for such an innovation. As the future of mass transit, and potentially a "metro system" for the entire country, Hyperloop locations could be a target for all sorts of violence. It's a topic that most executives would have shied away from, but Ahlborn was surprisingly candid about the risks and dangers that could face a system that's promised to be un-crashable. There'll be no TSA-style hurdles for a user to get through, and instead the experience will be much closer to a trip on your local subway. In this instance, you'll rock up to a Hyperloop station, be pushed into a group of either 40 or 28, and led to board a pod. In order for the system to be cost-effective, pods need to be launched every 30 seconds, so you'll get into a pod ahead of time and be lowered, wholesale, into the tube. So what would happen if someone set off a bomb inside one of the pods? It turns out that the damage would be, comparatively, less extreme than current subway attacks. Since the tunnel is a sealed low-pressure chamber, if the tube is compromised and air begins to flood in, the pod that's 30 seconds behind will be forced to rapidly slow down. In addition, as soon as a drop in pressure is detected, the safety system kicks in and brings the chain of pods to a gentle stop. The idea of riding a Hyperloop may seem fanciful, but if things go well, it won't be very long at all before one opens to the public. The company has signed a deal to build a 5-mile long track at Quay Valley, a new town in California that'll house 75,000 people as well as a 600-megawatt solar power plant. If, and it's a big if, ground can be broken on the city in the near future, and if all goes well, then we could be just a few years before the public can get their first taste of high-speed transit. 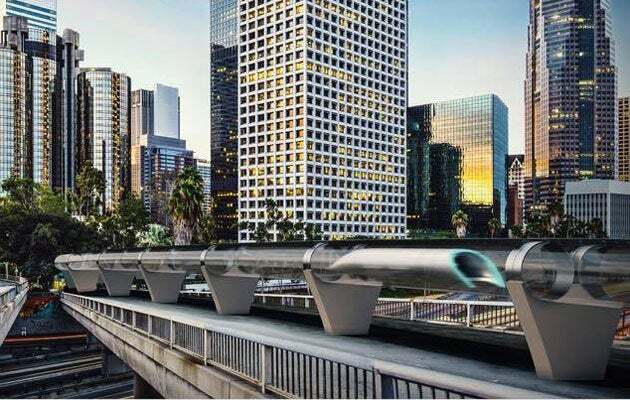 Unfortunately, due to the short length, it won't be as fast as the theoretical maximum, and Ahlborn is planning to use the development to refine the system ahead of the first "national" Hyperloop line. If that's a success, then the company is likely to break ground on the first major city-to-city project soon afterward. Ahlborn has already received plenty of interest from cities (or more appropriately, pairs of cities) that wish to be joined closer together. He believes that, due to the political and economic climate, it's likely to be a location outside of the US and Europe that will be the first to have a functioning route. 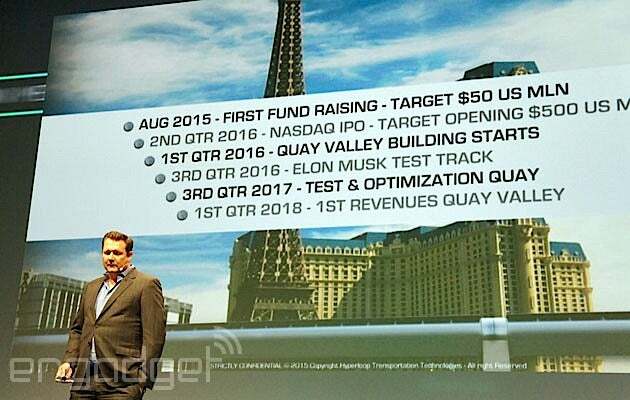 Until then, Ahlborn is hoping to encourage more people to join the Hyperloop team, especially in Europe, where he's looking for people to get the word out to the masses -- so if you're interested, you can leave your details here.